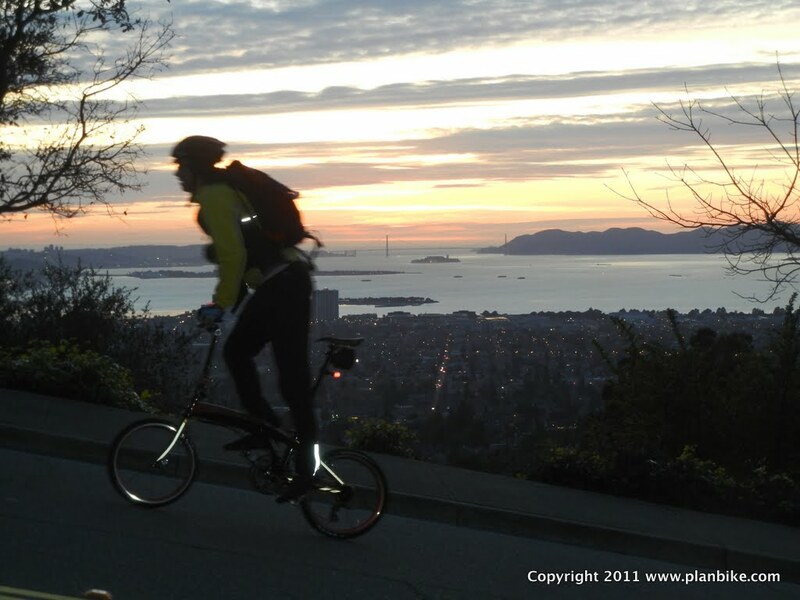 This is a love story and a cautionary tale of my first bike commute on my new super light folding bike: Tern Verge X20. Given all that, I leverage regional public transportation systems all I can to ensure I don't spend 4+ hours a day commuting. If the Bay were a rectangle, my work would be diagonally located from my home. That means going across and down or down and across the bay. That either means taking BART (Bay Area Rapid Transit) to San Francisco and CalTrain down the peninsula or taking BART down the East Bay and the Dumbarton Express bus across the Dumbarton Bridge. The first option was preferable because the CalTrain system on the peninsula has dedicated bike cars. No other system in the Bay Area does. Therein, lies the real challenge for my bicycle commute: public transit bicycle policies. No public transit, except for CalTrain, is very keen on seeing cyclists around rush hour. BART outright bans them for each of the two rush hour periods on their transbay tunnel. Initially, I took the alternate route to dodge BART's bike curfew for the SF transbay tunnel. I would take BART south to Union City and either cycle across or bus across the Dumbarton Bridge. I was astounded and impressed to find that the Dumbarton is the one bridge from the East Bay that has a bicycle/pedestrian lane all the way across. This is a heartening fact in the face of the recent Bay Bridge reconstruction that includes a bicycle/pedestrian path that only goes halfway across the bay to Treasure Island (aka a bridge to nowhere). Anyway, for the first few weeks of April, this plan worked fine. If I got up early enough, I would BART down and cycle across the Dumbarton. The whole trip took 90 minutes but who's counting when this includes a workout (aka a reprieve from a gym visit). Whenever I woke up late, I would bus across (with my bike in a rack) and the whole trip took 70 minutes. Neither option was super fast but given that a traffic jam could make a car trip 90 minutes or more, either wasn't bad at all. Not to mention, you could fill the whole time with web surfing or reading instead of driving. Then Spring hit. It stopped raining and warmed up enough that other cyclists started having the same idea for crossing the Dumbarton. This ensured that the Dumbarton Express bus racks were always full. I tried getting to it a little early but no dice: still full. After all, there were only two racks. I quickly realized that the Dumbarton bus route was not a reliable option for a cyclist given the limited bike rack capacity. This produced a real bind. I didn't have time to cycle the bridge everyday and I couldn't reliably get up early enough to beat the bike crowds to the Dumbarton Express bus. Right about that time, someone asked me to carpool so I took a bike commuting hiatus. However, this felt more restrictive than all the bicycle curfews I was avoiding. No longer could I stay late at work or run errands at lunch with my bike. Carpooling wasn't working but, by then, I had really fallen off the wagon with early rising so it felt like I couldn't turn back. Months passed. I gained 10 pounds. I had failed to replace the cycling with another form of exercise. This wouldn't do. After trying and failing to get BART to lift their rush hour bike curfew, I suddenly realized that BART's curfew excluded folding bikes. I researched those and found almost all to be sorely lacking in simplicity, sturdiness and speed. The one exception was a new generation of bikes coming from a company called Tern. 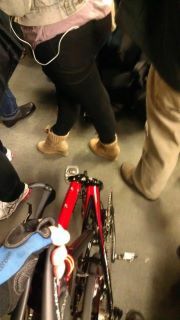 With a folding bike, I could travel with impunity on any transit system. The bike wouldn't even need a bike rack on a bus and it would circumvent the curfews on BART. Best of all, because it was ultralight and ultrafast, it would climb hills and cross flats almost as fast my road bike. "Woohoo! What a great time to be a bike commuter", I thought. Tern is not only a brand new bike but a brand new company. Josh Hon, son of David Hon, broke away from his dad's folding bike company, you guessed it, Dahon to start his own folding bike company,Tern. The realities of starting a new company, plus some family acrimony, seemed to keep the bicycle's arrival perpetually imminent over the holidays. Given my weight gain and total lack of will power for any other kind of exercise, I was getting desperate. After months of waiting and "weighting", the bikes finally arrived on the market and I bought the first one I found. It is here where this story really begins. The first day of bike commuting with this cutting (aka bleeding) edge commuter bike was both fantastic and horrific (no fault of the bike's btw). The first moments were ecstasy. The bike was very stable while I reached 50kph going down 300 meters of vertical. I only added about 2 minutes to the first leg of my commute. Not bad! Better still, I walked onto the BART train for San Francisco with no fear of punishment even though the sign flashed "NO BIKES". The train wasn't that crowded so I didn't even bother folding it. But when the train did fill up, I had it in a pretzel in seconds. Even some of the folks on the train were impressed. Once across the bay, I discovered I had 10 minutes to get to the CalTrain station 2km away. This was a job for the super fast Verge X20. Again, it performed magnificently, I found the small wheels of the folding bike much more nimble at dodging pedestrians and weaving through cars amidst the morning gridlock of downtown San Francisco. Likewise, the bike cruised along at a respectable 25kph on the flat long blocks. All my waiting, planning, and spending on this new cutting edge commute tool had paid off. I was leaving all the other heavy and slow commuter bikes in the dust. Then fate turned on me. It started when I arrived at the SF CalTrain station just as the doors closed on my train's gate. That cost a 15 minute delay. No matter, I thought. The bike was fast, I could still make up time on the last leg in Menlo Park. I hit the ground running in Menlo Park, I got off the train and on the bike in seconds. I charged ahead on one of Menlo Park's beautiful bike lanes to make up some lost time. Then, 100 meters out, I ran over something weird only to feel that unmistakable rumble from my rear tire. Ugh!!!!!!!! A flat. One thing I am pretty good at is being prepared for these mishaps. The day before, I had made a special trip to the bike store for spare inner tubes for just such an occasion as this. I had also enquired about extra tires but all the shop had were unfoldables so I skipped those. I figured I would order them soon. Not soon enough. The flat was from a cut to the sidewall. That's death for any kind of tire. So there I was: rendered a pedestrian by a tiny piece of metal with a kickass new foldable bike in tow. I went back and gave the jagged metal a good kick to vent frustration and spare someone else the same fate. My fate was just getting warmed up. I've been without a tire or tube before. It's a long walk but eventually you get to a bike store and you are on your way. But this wasn't just any bike so I couldn't use just any bike store. I needed a 20" diameter, 1.1" wide, tire. That's Greek to most standard bike shops, and folding bike shops for that matter. Where had I seen folding bike dealers in this area. Only 2 shops out of a dozen came to mind. Is the shop open? I am late to work but it is only 9 a.m.
How will I get to the shop in my bike shoes without trashing my ankles? After making a few calls, I discovered the 2 folding bike shops were open. However, the bike was so new that none of the staff had heard of it, much less knew which parts would fix it. Still, after a LOT of explaining, I established that 1 shop had a tire I could use. Naturally, that was the most distant shop. Googling for public transit solutions only embellished the need for a working bicycle in times like these. No buses were nearby and no bus would take me anywhere near the shop. Ironically, CalTrain got the closest to the shop so I walked back to the station, waited a quarter hour, and caught the next train. The next hour was filled with lots of super fun walking in bike shoes and having the rare cab swiped from me by a business man while I folded my bike. But I finally got to the shop, got the tire and rode to work. Only 2.5 hours late. Woohoo! The moral of the story for me is this. Like any bleeding edge solution, be prepared to provide your own tech support. The newer the solution, the fewer resources to help when things go wrong. After my ordeal, I even discovered that the shop that sold me the bike had sold me the wrong size inner tubes. When you are on the bleeding edge, you are really on your own so be prepared. Internet shopping makes this easy but I jumped the gun by cycling without all the supplies. Despite my initial lack of supplies and abundance of bad luck, I have no regrets. The ability of this type of bicycle to negotiate both the capricious bike policies of regional transit systems and the capricious streets of downtown rush hours, should ensure these bikes become increasingly popular. That should mean more stores will carry them soon and, in turn, mean I will have less far to walk for parts. Regardless, I now stock a new tube and tire on my back for this bike as I do for all my full sized bikes. I gambled and lost this time but I won't again, especially with such a wonderful new type of bike. Nice bike! How do you like the flat bar? I ride an intersecting path from you most days, I'll keep an eye out for that sweet-looking Tern from my blue Pocket Rocket. Great writeup! Nice to see such a detailed account of multi-modal commuting, including the thought that goes into route planning, and the pitfalls that still exist in the public transportation arena. Btw, the last name for Josh and David is just "Hon". Thanks. Fixed the names. Ugh! Need to do better fact checking. Great post! We're a Tern dealer in the DC area, and carry a wide range of folding bikes, so I shared your post on our shop Facebook page. I'm gonna be in DC at the National Bicycle Summit. I'm flying in with nothing but a Tern for wheels. I try to drop by. Yah. That might have helped. However, I have had boots blow out in the sidewall because of all the flexing. And, thanks to my lack of focus, I had a 16" replacement tube that wouldn't fit my 20" tire so I would have needed a patch kit as well. In your nice article on nyceweheels you said that since you are 190.5 cm (6'3") tall you had to do a seat adjustment and a 3 cm "riser" handlebar on your Verge X20. I am considering to buy a Verge X20 and would need a similar adjustment. Could you please let me know what components you used and where I could get them? Many thanks. I have a brand new x20 verge only rode once. Any idea what I should try and sell it for?